I will be honest. I love dressing up. It’s fun for me, it makes me feel special, and I love all the treats and attention I get. It’s one of the many things I do with my human that bring us closer together. But my human feels guilty dressing me up sometimes — because there are not a lot of cats like me! So I am not a good example to follow. More often when you see a cat wearing a costume for Halloween, or a Santa suit for the holidays, they don’t look terribly thrilled. Some look downright miserable. I feel really bad for these kitties because they aren’t enjoying themselves, and it’s not a bonding experience with their human. 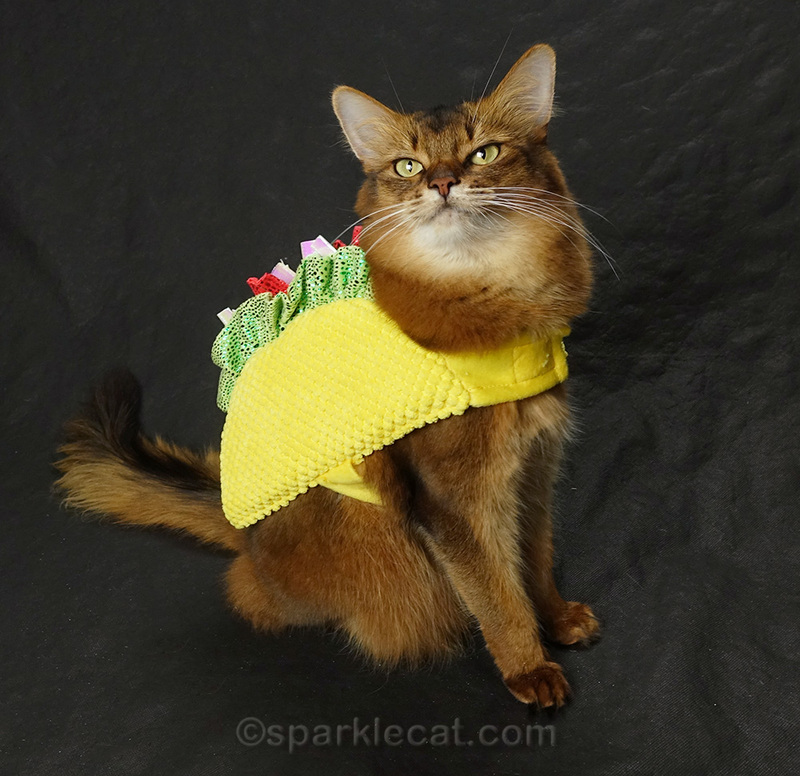 From what I’ve seen around Facebook, and heard from my fellow blogging cats and their humans, most humans have tried to dress up their cats at least once or twice. Usually the results aren’t very happy, and the hat or costume is put away somewhere, never to be seen again. (Or at least put away until some other cat gets the opportunity to try it on.) 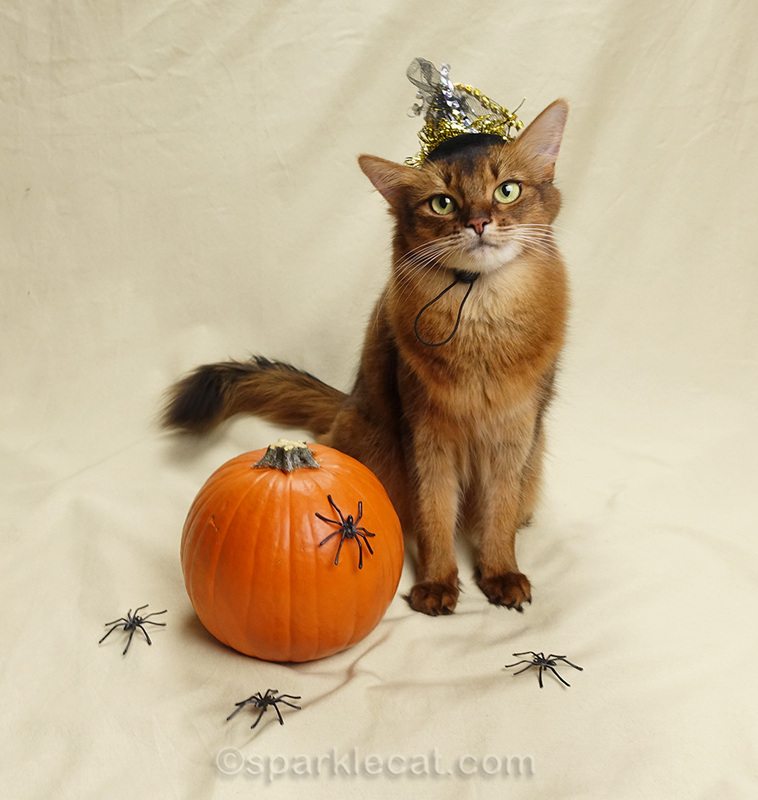 So I decided to put together some tips on when it might be okay to dress up your cat for Halloween, and when it’s not. Never dress up a shy cat. Shy cats have trust issues, and they need to know that you will treat them with love and respect. They don’t see being stuffed into a costume as either love or respect. In fact, if you have been working to gain a cat’s trust, putting a costume on her may take your relationship with her a few steps back. No matter how outgoing your cat is, don’t force a costume on him. If he struggles while you are trying to put it on, it’s not going to end well. You won’t get the cute photo you were hoping for, and he will be mad at you. If he is stiff and surly once you get the costume on, get it off immediately. A photo op is not worth ruining your relationship with your cat. Does your cat roll over and lie down after you put a costume on her? Tempt her with a really good treat — low salt deli chicken, or something that’s her favorite. If she gets up for the treat, then she didn’t actually mind as much as her behavior suggested. If treats won’t get her up, she’s definitely unhappy, and you need to take the outfit off her. Incidentally, this is also how you get cats used to wearing harnesses. You bribe them with treats, or interactive toys. Hats can be troublesome. See if you can get one that’s small enough to fit between the ears, or that looks good just covering one ear. Many cats don’t like both their ears scrunched and covered up. The strap should be secure enough to hold the hat on, but not uncomfortably tight. If the cat keeps looking down, tempt him with a treat. If a treat or toy won’t inspire him to look up, ditch the hat. 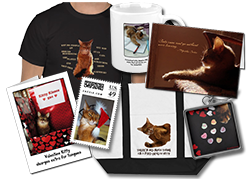 The best costumes for cats are loose fitting and not confining. My taco cat outfit was so comfy, I barely knew I was wearing it. Same with my nurse’s dress. The worst ones are those that are too snug, or dog costumes that have a headpiece attached to the body. These almost never fit cats properly, and they are really uncomfortable. Trust me, I know! The hardest part of having a cat in a costume is getting her to sit still for a photo. My human trained me to sit and stay for treats long before I wore dresses and costumes on a regular basis. So I know what to do. Most cats will want to wander around, chase after treats or toys, and have a hard time sitting still. (This would describe Binga!) You might consider shooting video with your phone instead of taking still photos, if you are just going to post on social media. That may be your easier choice. How does the cat react after you take the costume off? If he acts like nothing particularly odd went on, and is back to his usual self right away, fine. If he is mad, aggressive, or hides after you take it off, he didn’t like it. Toss the costume and make it up to him for upsetting him so much. Again, a photo op is not worth damaging your relationship with your cat. 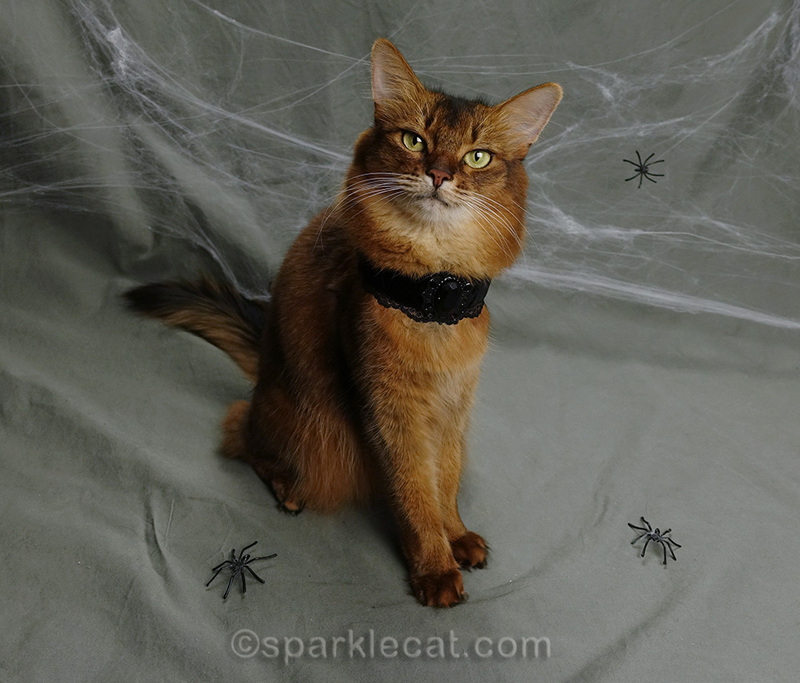 If your cat wears a collar, instead of a full costume, consider trying some sort of festive collar instead. These won’t feel so strange, and are far less likely to upset a kitty. Cats are really more adaptable than people give them credit for. Some will wear a costume or outfit with no problem, once they gets over the weirdness of the situation. Some won’t want to wear anything at all, ever. And occasionally, there are cats like me that are happy wearing costumes from the start, and have a good time dressing up. No matter what type of cat you have, I hope you have an awesome Halloween, and you follow your cat’s bidding! Summer, you make all your clothes look good. The tips are great. I don’t mind getting dressed up as long as mom doesn’t get too carried away with the clothes. I prefer my nekked-ness. It is NEVER ok to even THINK about dressing any of US up!!! MK wants to keep her fingers! Pipo is semi OK with costumes, cause he knows they will be off shortly! Festive collars work the best for him, though. He was better when he had Minko to be his cohort and ‘assistant’. You are quite the special kitty, Summer! Mum has never tried to dress me because she knows I wouldn’t like it. I have worn a halter since I was quite young. I need it to exercise my human. It is sort of like charity work lugging her around after me. But as for other costumes, no way. Summer, these are really good tips. The lady thinks Pierrot would be open to being dressed up (no hat), but she doesn’t want to spend money on costumes since she’s not completely sure and it would just be for a small audience (blog and/or FB). That being said, all your dress-up photos are so fun to see. The accompanying photos today with the Halloween theme are great! Those are excellent tips. I know Polar Bear gets upset so I don’t bother him, but everyone else does pretty good, especially Joanie and Trouble. Great tips, Summer! In the past I’ve attempted to dress up my cats and it hasn’t been enjoyable for anyone. With Mudpie I haven’t even tried…maybe one day though! 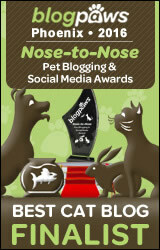 This is a pawtastic post chock full of great information! We have a photo of Lexy in a reindeer hat where she looks like she wants to scratch our mom’s eyes out! She pretty much respects our wishes now, which is no costumes! She gets your calendar and gets her fix with that. Happy Howl-o-ween Summer! My peeps can’t even put a collar on me. I can’t stand anything around my neck. They know and respect thatâ€”or maybe they just respect being alive. Happy Halloween Summer! A fab post with excellent advice 🙂 and your photo’s as always are EPIC! We don’t mind costumes but never look as good as you do. You’re such a great sport, and I hope that you got Treats!! Summer you just make me smile so big and I love tacos. Nobody knows more than you about the ins and outs of dressing up kittehs. We definitely live vicariously through your adventures, but we aren’t up for it ourselves. Angel usually enjoys being dressed up, especially hats! Chucky hated it with every fibre of his being. Da Boyz could care less; they are so easy going! You always look adorable in your costumes. Mom Paula tried dressing us up when we were little, but we couldn’t stand it. We don’t even like collars. We have to depend on PhotoShop for our costumes! MOL! Those are wise tips, Summer sweets. There are some costumes I don’t mind wearing for a brief amount of time. For instance, Mom got me a t-shirt and it was of thin material, not confining and I it gave me freedom of movement. I didn’t even care that I had it on, ’cause I was just interested in getting some treats. Tee hee hee. I don’t mind wearing festive collars as long as they aren’t of the itchy kind or tug at my long furrs. Hats, on the other paw, are not my thing. I’ll tolerate a hat for a second or two, just long enough for a couple clicks of the camera, but them I’m done. Hugs. Laser managed well with a colar once, for a ‘Sunday Best’ photo when she was a kitten. McLaren had a colour on when he was adopted but I got rid of it (it turned into a toy, because it was just a velcro strap). Lots of kitties will appreciate your advice today Summer. Thank you for sharing. We refused to wear real costumes this year, Summer. You always look cute in yours. Happy Halloween! Gracie and Ava opine thatâ€™s what Photoshop is for. Great tips, Summer! Those were great sweet Summer. I don’t mind wearing things at all it just never seems to happen much. Happy Halloween from all of us! This is great advice, Summer! Goro rolls over when he puts on harness, claiming he can’t move. But he quickly recovers when he sees treats 🙂 You look super adorable in your costumes! Good advice. Not all cats are like you. Instagram has tons of cat costumes but to really see how miserable some cats are, YouTube can’t be beat. People will do anything to get views at the expense of their cat. Those sure are some good pointers. Summer, you sure do a good job with wearing costumes. Two Two loves to wear them. That is excellent advice, Summer! You of course are such a pro and we can see that you enjoy the costumes, and look fabulous in them! #1 mostly stays away from trying to dress us up, other than special collars at Christmas. We would never tolerate costumes here! Happy Halloween and be safe!